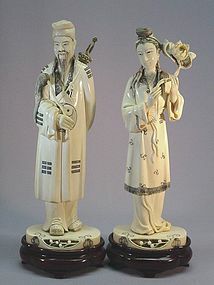 These rare ivory carvings of two immortals are early 20th century products. The male immortal is Lu Dongbin; he is 8 ¾” high (with base is 10” high), 3” wide 2 ½” thick. The female is He Xiangu; she is 8 ¾” high (with base is 10” high), 3” wide 2 ½” thick. Lu Dongbin ( 呂洞賓 ) is one of the most widely known of the group of deities known as the “Eight Immortals” and considered by some to be the leader. He is depicted as being dressed as a scholar and often bears a sword on his back that dispels evil spirits. He Xiangu ( 何仙姑 ) is the only female deity among the “Eight Immortals”. She is depicted holding a lotus flower which represents the improvement of mental and physical health. Both statues have honorific "Qian Long" marks on the bottom. Aside from one hair line crack on the bottom of female statue, they are in great condition.